A little less than a year ago, we decided to enter League of Legends, and field a team that is capable of matching up with the best in the region. Although our previous line-ups have brought home some very admirable results, we have made the decision to completely rebuild our team based around our team captain Finn-Lukas “Don Arts” Salomon. Carefully selecting a balanced combination of young talents, and experienced veterans, this line-up was created to take our presence in League of Legends to the next level, and become a consistently strong contender in the DACH region. New season, a “BIG shuffle” and a strong new lineup! 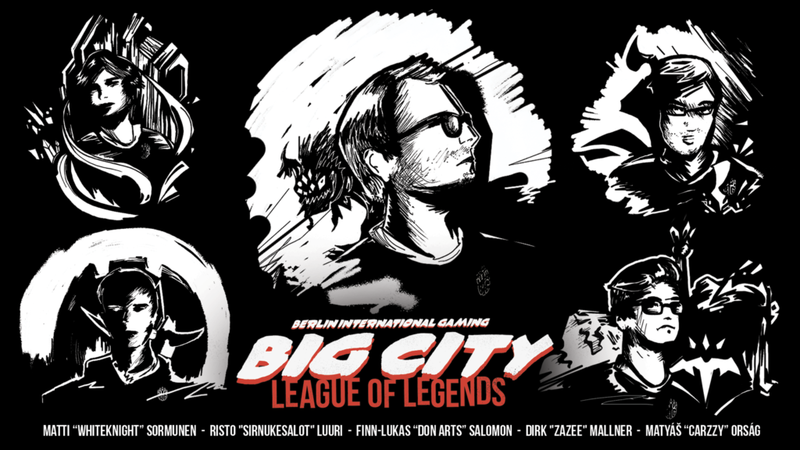 When we decided to do League of Legends in BIG, we were all on the same page to stay German (at least with three players). The DACH season is getting bigger and stronger with every split, now featuring UOL and S04.AT as new teams with EU Masters ambitions. “DonArts” and coach “Arvindir” are the only two members of our former roster expanding their contracts. Together we had a very good plan to build a strong lineup, maybe the strongest pure German team at all. In the end we had to change our plan after finding out that one player didn’t keep his word and left us for another team. We decided to play this split with three import players since most of the DACH players were already contracted to other organizations, bringing in two former LCS players with “WhiteKnight” and “SirNukesAlot” to help our younger players improving. Adding one of the hottest talents in EUW with “Carzzy” and a very promising German midlaner with “ZaZee”, who made himself a name with moving into Spain’s LVP after becoming German Champion last spring split, makes me personally proud. I´m also really happy that Navio stays with us as a substitute, primarily focusing on his school till summer to evaluate a possible career as full time player afterwards. Last words are dedicated to “AngelArcher”, “Jenax”, “NilleNalley” and “NightmareS”: Thank you for everything you have done for us, we will miss you! When I joined BIG half a year ago I was not sure if the League project is gonna be successful since for me, BIG was always a CSGO organization. From split to split, step by step we have always improved on the roster, coaching staff etc.. The BIG management has put a lot of trust in me to form a good roster and to make long term improvements and I am certain that in 2019 the fruits of our hard work will finally pay off. We’ve build a roster that can compete with every team in the German scene and for me personally, this is probably the best roster I have played with so far in my career. Taking this in consideration our goals are set high and we all will work hard to achieve them and make you, the fans, proud! On every position we have a top tier player and the first scrims are already showing how much potential this team has. Obviously we still have to get that synergy on point but with our insane coach Danusch “Arvindir” Fischer this should not be a problem. The mixture of talent, experience and a good attitude rounds out our team perfectly and I am really looking forward to start competing again! Fans will be able to see our new line-up in action in just a few days, as they will be playing their first official game on the 23rd in the ESL Meisterschaft! Keep an eye on our social media feeds for more information about the match.